Luxurious 1+1 apartment in city center. 12-year loan! This new project will take you 365 days to wake up to the endless blues of the Mediterranean and the unique beauties of the Besparmak mountains. 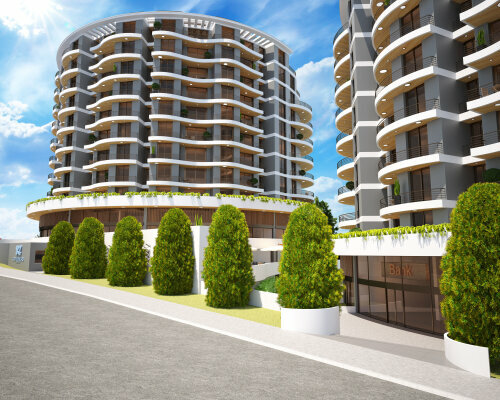 It is a central location where you can reach all your needs in 1 minute distance from Nicosia and Kyrenia connection roads. This amazing one bedroom apartment with luxurious architecture and designs is presented for both living and investment. There is also a nice 10 m2 terrace with stunning view. Even more restaurants and cafes, supermarkets, shops, various services are available at walking distance in the city. There is a nice cozy park with beautiful birds and different pets, and a playground for kids located in just 15 minutes from the complex.